Alex Holmes' documentary about Tracy Edwards and her all-woman Whitbread sailing crew is both timely and intensely relevant. It starts with a warning: “The ocean’s always trying to kill you, it doesn’t take a break.” But the terrors awaiting the subjects of Alex Holmes’ crowd-pleasing documentary “Maiden” go far beyond the sea itself. Tracing the journey of forward-thinking female sailor Tracy Edwards, “Maiden” unspools a heart-pounding race around the world, but the true challenges facing Edwards and her all-woman crew include institutionalized sexism, a media circus unable to look beyond a splashy story, and crushing self-doubt. It’s a timely and relevant story about bold women breaking down barriers while some of their male counterparts go through the motions — dismissing them, gawking at them, not believing them, and finally, begrudgingly, letting them in. That it’s set mostly in the late-’80s doesn’t diminish its relevance one bit. Holmes, best known for his 2014 documentary “Stop at Nothing: The Lance Armstrong Story,” is in familiar waters with “Maiden,” though the film is aided by the addition of a likable star, the fiercely independent Edwards, who anchors a series of talking head interviews with all the major players. Edwards is intriguing enough to watch tell her story, but she’s also joined by some of her former crew members, who are just as engaging as their former captain, and clearly with more stories to tell. Each one of them could presumably star in her own documentary, and “Maiden” only examines just one story from an experience that changed the lives of many of its subjects. 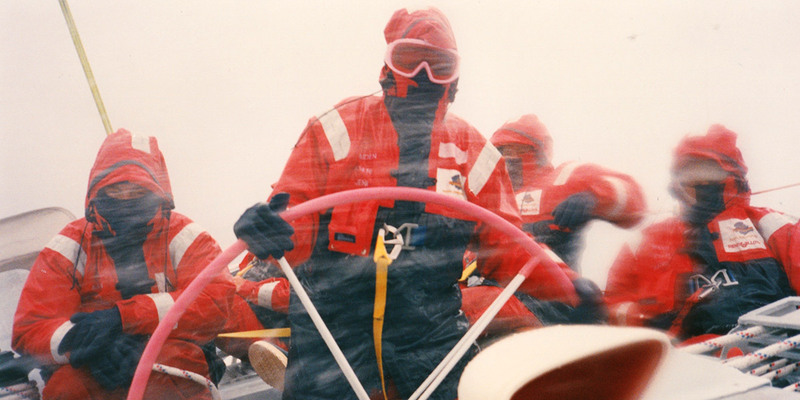 The director assembled a wealth of sources for the documentary, from footage shot during the film’s central sailing race, to archival news video that provides an occasionally maddening look at the media coverage surrounding Edwards and her 1989 journey. Introduced as a headstrong and shiftless young woman who ran away from home and ended up in the boating world by seemingly dumb luck, “Maiden” sacrifices some biographical clarity about its leading lady in service to getting to the main story: how a 24-year-old novice ended up skippering a yacht on the world’s longest (and arguably most challenging) sailing race, surrounded entirely by fellow women. Spend enough time with Edwards, though, and it’s clear that she’s the kind of person who can make things happen just by sheer force of will. After falling in love with sailing – and the fellow “misfits and gypsies and nomads” that populate its crews – Edwards becomes determined to not only sail the tony Whitbread Round the World Race, but to do it as skipper and with a crew made up only of women. It’s a big, status quo-shaking idea, and one that Edwards knows well, as Holmes’ film spends plenty of time discussing her early attempts to get on a Whitbread boat simply as a cook. Even that was a bridge too far for most of the men who sailed the Whitbread, or who covered the Whitbread, or were even tangentially involved in the Whitbread, as Holmes includes a number of them as interviewees, most of whom are somehow still comfortable chatting about their shock that a bunch of “girls” would even cook up the idea to sail the Whitbread. They’ll see. In fact, they did see, as Edwards battled back lousy media attention, a crippling lack of funds, and early internal struggles to assemble her crew (set to sail on a yacht named, of course, Maiden) and take on the Whitbread. No one believed in them, and once Holmes’ film gets to the race, “Maiden” unfolds in eye-opening ways, flush with shocking twists and turns that seem pulled out of a Hollywood playbook, enlivened by the addition of a stellar ensemble of Edwards’ fellow sailors who, even in their reflective talking head interviews, are as vibrant and outspoken as ever. At one point, young Edwards blithely tells a reporter she doesn’t consider herself a feminist (though that changes later in the film), but every action she and her crew undertake tells a different story: they just wanted to do what the men did, and it sure as hell didn’t hurt that they did it better. While Holmes briefly touches on Edwards’ personal life as the film rockets towards the 1989 Whitbread, those choices eventually rob “Maiden” from delivering a full portrait of everything Edwards had to do in order to even enter the race. Her unhappy late childhood, her apparent drinking problem, and a pre-Whitbread existence that included enough time (and money) to buy her own house, all are left as open-ended questions — to say nothing of Edwards’ life after the race. There’s plenty left to explore not only about the film’s determined heroine, but of a history-making race that surprised at every turn. While “Maiden” is satisfying on its own, it’s tailor-made for a remake that can dive deeper into a story that has so much life left in it. “Maiden” premiered at the 2018 Toronto International Film Festival. Sony Pictures Classics purchased domestic distribution rights at the festival.